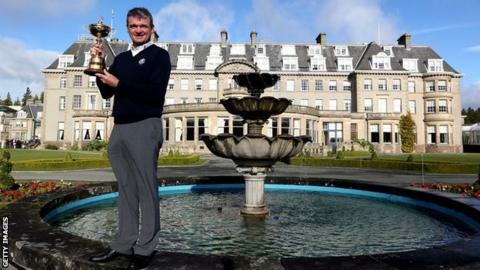 Ryder Cup winner Paul Lawrie has set his sights on playing to defend the trophy on Scottish soil in 2014. Lawrie, who beat Brandt Snedeker as Europe overturned a 10-6 deficit to win, brought the trophy to Gleneagles, the venue in two years' time. And the Aberdeen golfer believes he will be in even better shape to help defend the transatlantic title. "I think I'm getting better as I get older, so I'd like to think I'll be on that team at Gleneagles," he said. While not ruling out a desire for a future role as captain of the European team, the Aberdeen golfer insisted 2014 would be too soon to take on that role. "First and foremost I want to play on the team," said Lawrie. "I think the captain will be picked around February so by then I believe I will still be roughly where I am in the world rankings so I can't see them picking me as captain, and to be honest I'd rather play and give myself a chance of getting on the team. "In the future I'd definitely like to do it, but I think just now I'm getting better as I get older as a player so 2014 is just too soon for me. "You don't know what's going to happen down the line but right now I feel very competitive at 43 and I can't imagine I'm going to be any less so in two years' time." An impressive season for Lawrie was capped by his 5&3 victory over Snedeker in the singles at Medinah as Europe's final-day resurrection stunned the home crowd. "It was a special victory because it's a tough crowd over there," he explained. "You take it a bit in the neck from their spectators because they want the Americans to win badly, so to turn the score around from 10-6 down to win is just a huge achievement by everyone on the team. "I don't think anyone wanted Jose Maria [Olazabal] to be a losing captain so we wanted to make sure we did all we could for him." "Last time I played we lost and maybe should have won, so, this time, on American soil, to be 10-6 down and come back and win, everything had to be right on the day. "The first four or five games had to win to set the scene to make sure we had a chance later on andit just happened perfectly." Lawrie is playing in this week's Dunhill Links event, which has a pro-am format, and he is competing alongside his 17-year-old son Craig, a scratch handicapper who caddied for his father at the Scottish Open in July.